Eliminates the need for childcare? And does not require lengthy training? 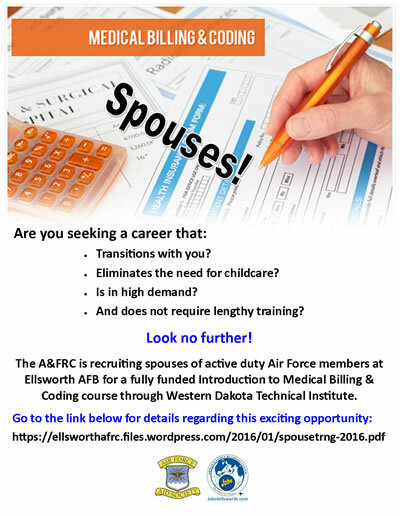 The A&FRC is recruiting spouses of active duty Air Force members at Ellsworth AFB for a fully funded Introduction to Medical Billing & Coding course through Western Dakota Technical Institute. This entry was posted in Employment, Spouses and tagged Medical Billing and Coding, Spouse Employment Program by ellsworthafrc. Bookmark the permalink.